Following up on my previous post on learning and wicked problems here, the following diagram summarises a learning process in non-routines knowledge work. Again, this comes from Peter Sloep’s Chapter on Networked Professional Learning in Littlejohn, A. and Margaryan, A. (2014) Technology Enhanced Professional Learning: Processes, Practices and Tools. London: Routledge. 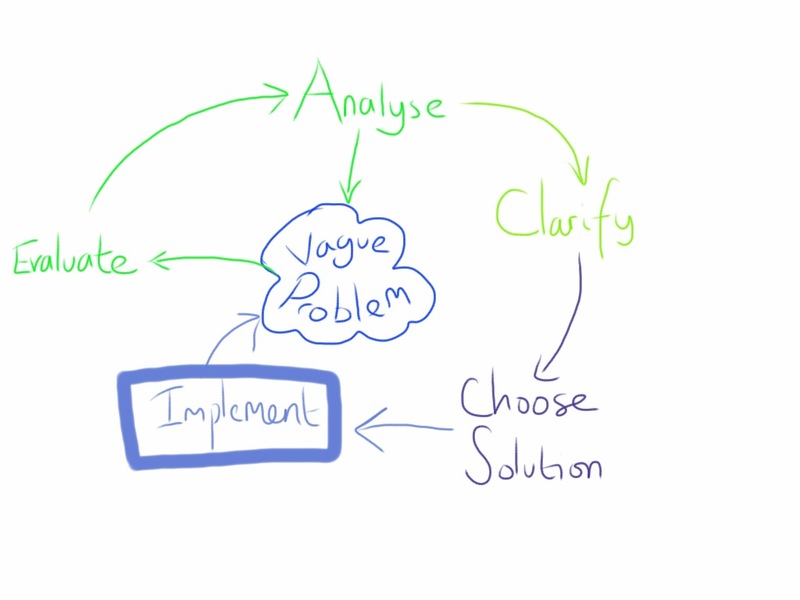 What I like about the process described is its iterative nature and that, ultimately, the ‘vague problem’ doesn’t really disappear through a simple solution. Rather, my reading of the process is that ‘solutions’ and their implementation generate further understanding of the vague problem, hopefully making it less vague and so initiating a new round of evaluation and analysis. But also, any intervention also generates new unexpected and vague ‘problem’s to be learned about and addressed.